Universal, widescreen 1.85:1, standard 1.33:1, languages: English DD 5.1 [CC] & Digital Mono [CC], subtitles: English, Spanish, French, 3 disc set, single side-dual layer, chapters NA, rated NA, 339 min., $74.98, street date 8/3/99. Next time you throw a birthday party, don't ask the folks at Universal Studios to organize it, for if their "celebration" of Alfred Hitchcock's one-hundredth birthday provides any indication, you affair will be awfully lackluster. 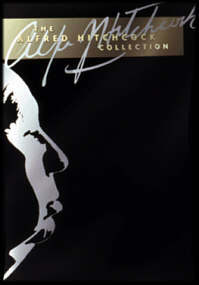 1999 marked the hundredth anniversary of Hitchcock's debut and to make the occasion, the bigwigs at Universal went all out: they released a three-DVD set called (creatively) The Alfred Hitchcock Collection. This package includes two previously-issued DVDs for Psycho and Vertigo plus a new release of four episodes of the Alfred Hitchcock Presents TV show. Whoopee! Where do I get my party hat? Perhaps I'm being unfair because Universal did issue a more comprehensive box set of Hitchcock films on VHS, so it's not like this DVD package encompassed all of their efforts. I don't fault them for failing to issue all of those films on DVD in time for Hitchcock's birthday because I believe - perhaps naively - that the DVD release of many of his films has been delayed so they can ensure higher quality. After all, these are rather old movies and many of them have lost a lot of luster over the years, so some serious restoration was in store. Vertigo received a massive overhaul a few years ago, and Rear Window apparently just got the same treatment. As such, it should hit DVD later this year, and The Birds is due for release in a few months, so things are looking up for Hitchcock fans. Still, there's something mildly crass about the Alfred Hitchcock Collection package, mainly because of that new DVD of TV episodes. As of the time I write this (January 2000), that disc can only be found with this box set. As such, any diehard Hitchcock fans - the ones who already bought Vertigo and Psycho on their own - felt compelled to shell out the bucks to grab this set, even though that meant they were stuck with duplicate DVDs. It's either that or skip a program they'd really like to have. While the AHP DVD probably will appear on its own at some point, I have not heard of such a release. Actually, by now the point is fairly moot since the damage has been done; those who got stuck making multiple purchases have likely already suffered that fate. Hitchcock fans new to DVD won't have to worry about that issue, at least. Taken on its own, without this complication, The Alfred Hitchcock Collection makes for a very nice set. Both Vertigo and Psycho are good movies and nice DVDs; I prefer Psycho on both counts, but Vertigo is no slouch either. Since full reviews of both Psycho and Vertigo can be accessed by clicking their names in this sentence, I'll omit my usual long-winded comments about them. Suffice it to say they're both very good discs and refer to their extended reviews for detailed specifics. Since it's the only new component, I'll focus here on Alfred Hitchcock Presents. This DVD includes four episodes of that show: Lamb to the Slaughter, The Case of Mr. Pelham, Banquo's Chair and Back for Christmas. Because both production and disc quality varies from episode to episode, I'll discuss each on their own. All episodes are in black and white and feature monaural sound. LAMB TO THE SLAUGHTER (1958): This tale shows what happens to jerk husbands who cheat on their (apparently) mousy wives. Barbara Bel Geddes, who played a somewhat similar turn as Jimmy Stewart's devoted wannabe girlfriend in Vertigo the same year, offers nice work as the wife who finally snaps under pressure. The traditional "surprise" ending is decent and leads an interesting piece to a satisfying conclusion. The picture quality of LTTS looks slightly below average. The image seems fairly grainy and tends toward softness much of the time, largely due to some apparently low light levels. Despite the softness, some mild moire effects occur at times, particularly via the dots on Bel Geddes' outfit. The print itself appears pretty clean with only occasional scratches. Black levels looked nice and deep, and shadow detail was appropriately translucent and didn't obscure important facets of the image. The audio for LTTS offers a relative high point. There's nothing special happening here, but dialogue is clear and intelligible and both music and effects seem smooth and accurate. I noted no distortion. THE CASE OF MR. PELHAM (1955): Easily the best story of the bunch, this gripping and involving tale kept me rapt for the duration. Mr. Pelham seems to have a twin - or is he just losing his mind? That's the question over which you'll puzzle throughout this winner, which also features by far the strongest ending of these pieces. In comparison with LTTS, Pelham exhibits a consistently better image. The picture looks sharper and produces less grain, though it still seems mildly soft at times and shows a bit of grain. The print itself also appears a bit cleaner than that of LTTS. Both black levels and shadow detail continue to look good. Although the picture improved, the sound for Pelham takes a step down from what I heard during LTTS. The audio seems consistently edgy and sibilant. While I had no trouble understanding dialogue, it never appeared full or natural, and music and effects suffered from the same slight harshness. It's not a bad track but it definitely shows its age. BANQUO'S CHAIR (1959): A police inspector uses a ruse to try and trap a murder suspect by confronting him with the phony ghosts of the past. The weakest vignette of the bunch, BC kept me involved but not to a tremendous degree. It also suffers from a very weak and predictable ending; anyone who doesn't see it coming from a mile away may need new glasses. Still, it's well-acted and whatever suspense exists gets milked nicely, so it's worth a watch. As with the first two programs, BC looks slightly soft but not significantly so; actually, it's the best-looking entry of the group. Some minor grain appears and I saw slight moire effects in the tweed jacket worn by one character. Very few flaws were discerned; I detected no speckles and only found a few light smudges during one scene. Black levels, contrast and shadow detail all seemed very good; this episode doesn't look great, but it's easily the strongest visual presentation of the bunch. The audio for BC compares neatly to that of LTTS. It seemed clean and clear at most times, with dialogue that was always easily intelligible. Some weak-sounding overdubs come through but they don't really mar the track too badly. Music and effects were also fairly smooth and crisp, although the constant "rain" effect was somewhat distracting since it sounded a lot like tape hiss. Still, it's a relatively natural track that performs adequately. BACK FOR CHRISTMAS (1956): This story of a long-suffering husband who hopes to off his nitpicky wife seems slightly predictable but remains a fun effort, mainly due to a very good performance from John Williams as Herbert, the harried husband in question. Isabel Elsom also seems excellent as doomed hen Hermoine, one of those wives who knows how to do everything "perfectly", no matter what anyone else thinks. BFC lands right in the middle of the pack here and is on about the same level as LTTS in regard to program quality; the story isn't as good as that other episode, but the more compelling acting brings it up a notch. Unfortunately, BFC seems to be the worst of the bunch in both quality categories, though the picture pretty closely compares to that of LTTS. I didn't detect a ton of flaws but found some occasional scratches and speckles; much more significant faults occur during some stock footage of America, though (which I didn't hold against the program as a whole). Some slight grain appears and it looks about as sharp as BC. Black levels still seemed good though they were overly bright at times; the image never seemed washed out but the contrast looked vaguely harsh on occasion. Sharpness veers toward slight softness, though comparable to most of the others, with some mild moire effects in another tweed jacket seen here. The audio appeared fairly harsh and mildly distorted throughout the program. This affected dialogue, music and effects equally, though due to the talky nature of the program, I noticed in mainly in regard to the speech. It betrayed a lot of edginess and sibilance, which made the dialogue slightly hard to understand speech at times. It's not an atrocious mix for such an old program, but it seems disappointing in comparison with the other episodes, all of which sound better than BFC. While I have no qualms recommending The Alfred Hitchcock Collection to anyone who doesn't already own Vertigo or Psycho, it's not nearly as clear-cut for others. If you have one of the two, it may be worth your while. I already owned Psycho but a) got AHC for $34.99 after a Reel coupon, and b) sold my old copy of Psycho for $10, so I ended up getting Vertigo and AHC for the equivalent of $25 before shipping. Depending on your interest level in the TV episodes, it may be worth your while to pick up this package even if you can't sell your duplicated DVD if you can get it for $35 or so; that still means the TV shows will only cost you about $10. The box set only becomes clearly avoidable for anyone who already owns both Psycho and Vertigo on DVD. Unless you can sell those for a reasonable amount of money and/or get the box set for a very inexpensive price, I don't see it as being worth it just to get the TV episodes. They're fun but not something that deserves such a high level of effort to acquire. Yahoo! Alfred Hitchcock--A comprehensive directory on Hitchcock web sites.